For Japan, the comparisons for March 2015 estimates are going to be tough as the yearly look-back aligns to March 2014 and the great surge prior to the tax increase. The distortive base effects make it more difficult to figure out just how little was gained (or lost) in spending and income. So the large granular declines are not suggestive of a massive downward turn, but they aren’t necessarily showing any recovery either. That is especially true in real terms where a reduction in official “inflation” rates has bolstered that side of the ledger. I think we can get a sense of how things are still declining, though, from some of the subcomponents less aroused by the tax increase. 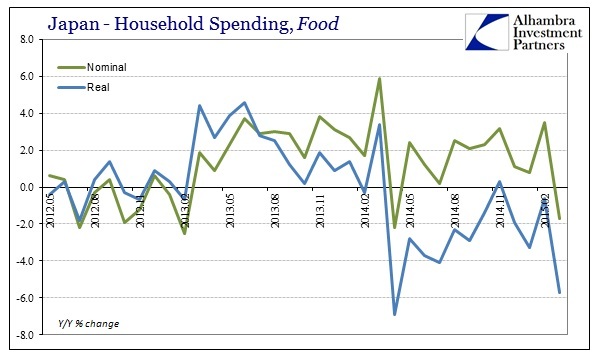 For instance, household spending on food continues to be highly negative with a much smaller tax footprint for the yearly comparison. In terms of spending on utilities, there was no tax change applicable so the general direction in spending is not distorted by the fiscal shift. Instead, the direction is all economics, specifically monetary economics. The reason for that is income, or the very distinct lack of it. 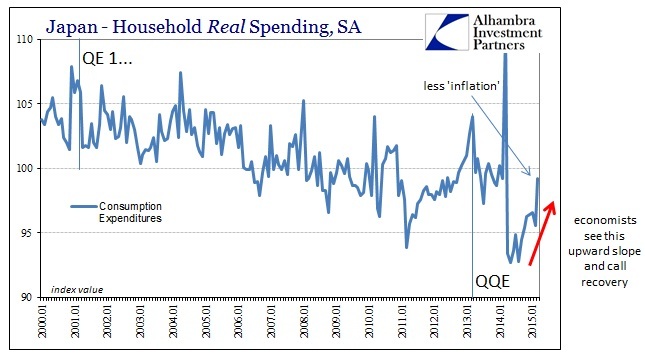 The reason why the tax increase was such a major alteration in the flow of spending was that incomes have been sinking steadily, including periods of nominal declines, since QQE began. 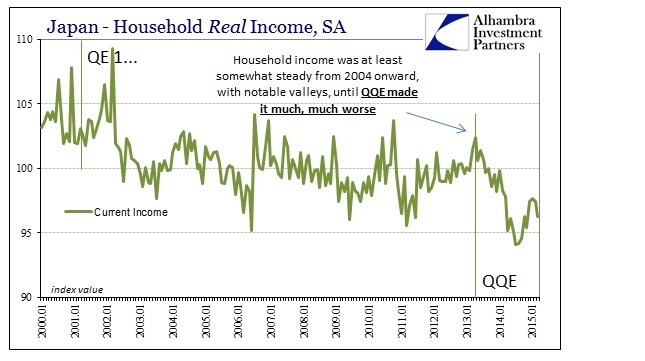 In other words, QQE has accomplished the exact opposite of its stated purpose by bringing about inflation that did nothing toward furthering economic gains in labor and wages, instead blatantly robbing Japanese consumers of purchasing power – and thus proclivity to spend any actual nominal gains when they happen to appear. This seems to be the common thread in every region suffering the blight of QE in all its forms, as there is an intentional narrowness in the standards by which its practitioners wish (demand) to be judged. In the US, as noted earlier today, that has meant a singular focus on the unemployment rate or the Establishment Survey but only from 2010 forward as if the relative change full cycle was not relevant. In Japan, economists only see the second derivative changes from April 2014 forward, measuring only that spending or income isn’t nearly as bad as that transition point. 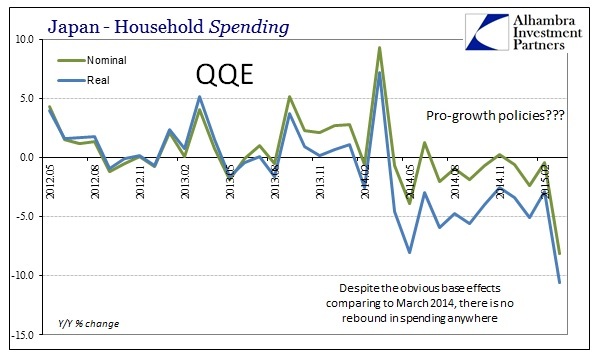 The reason for that is obvious, because on a longer-term basis QE and QQE are utter failures. Japan has been at it far longer than the US, dating all the way back to March 19, 2001. While the Bank of Japan has not been in constant disruptive mode, it has been far more than it hasn’t. 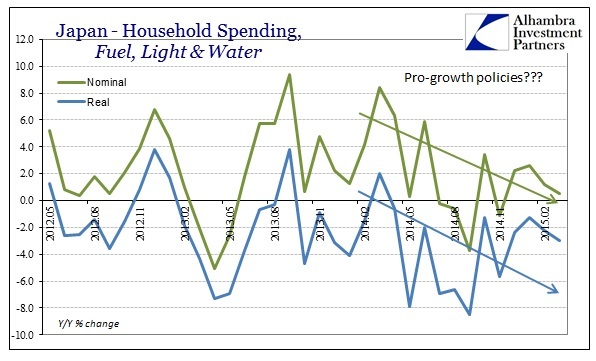 Economists only talk about the far right hand side of the chart immediately above, and see “recovery” out of the fact that spending isn’t declining as fast because “inflation” has backed off contrary to what the BoJ actually wishes to see. So in response, the BoJ threatens and whispers about doing more of the thing that pushed spending so low to begin with. But what is also plain is that from almost the very start of the very first QE there is almost a straight line of descent in household “demand” despite the clear monetary intent to conjure it. Again, for all the effort and yen created and expended in the pursuit of “aggregate demand” there is a shocking lack of it. The final line into QQE has only heightened that very obvious negative deflection. You could even make the case that spending had begun to self-correct out of the earthquake/tsunami ravages in 2011, punctuated and deterred once more by the BoJ that just won’t sit still long enough for anything to actually bloom (economically speaking). It has become, nowadays, habitual as monetarists are taking the wrong lessons from all this. I think that point is emphasized further and quite well by the longer-term trend in Japanese income. 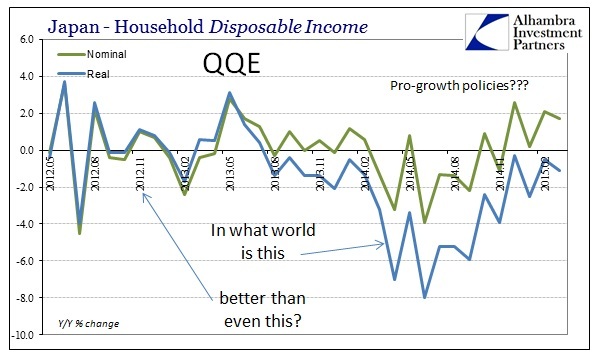 After the initial drop past QE1, incomes in Japan (real terms) were almost stable, interrupted only by global recession. That is, of course, deficient on its own, but at least there wasn’t a tendency toward making it obviously worse through monetary means; that all changed with QQE. Notice the trends in both income and spending moved downward not at the inception of the tax increase but at the very start of QQE itself. Science is the study of observation whereas monetary economics has become the science of avoiding them. If economists want to see recovery in that they should be honest about so redefining the term. BoJ is two years into QQE and the hole that has been dug for the Japanese people is enormous, so it will be extremely difficult at this point just to get back to even without ever accounting for lost opportunity for compounding and time. Maybe that doesn’t count as the typical, natural recession but it is nothing short of a man-made disaster.